Hundreds of images, civilian & military! 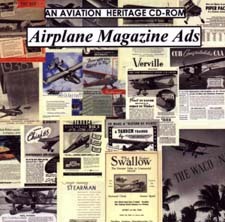 ORIGINAL Full-page magazine ads of hundreds of airplanes, of virtually every aircraft manufacturer of airplanes of the Golden Years. These original magazine ads are direct from the pages of Aero Digest, Popular Aviation, Flying, Western Flyer, Aviation, Readers Digest & many more! 1920s, 1930s & 1940s Magazine Ads are of the aircraft manufacturers and their airplanes, including: Aeronca, Luscombe, Waco, Tayorcraft, Piper, Stearman, Swallow, Bellanca, Fokker, Beech, Grumman, Heath, Vought, Verville, Northrop, Travel Air, Curtiss-Wright, Douglas, Globe, Republic, Ryan, Advance Aircraft, McDonnell, Curtiss, Boeing, Fairchild, Stinson, Pratt & Whitney, Culver, Rockwell, Aeromarine Klemm, Fleetwing, Lockheed, Bell, Sikorsky, Martin — virtually all of them! Civilian & military on one CD.